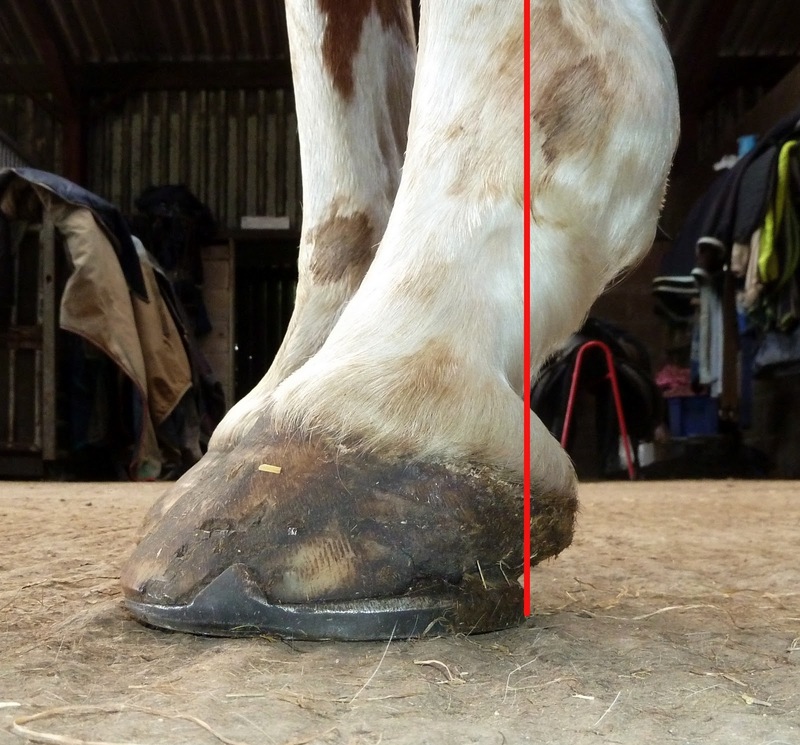 These photos show quite a dramatic comparison - Patsy's front hooves from the day she arrived 9 weeks ago till now. There is an enormous amount of change happening in her feet. You can see that there is a significant angle change occurring and that although her toe didn't look particularly long in shoes its going to be a lot shorter once the new angle has grown in. 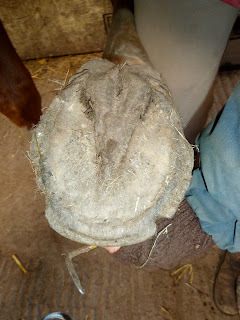 Although it looks as if the heel will under-run, her hoof already has more structure caudally so that should become stronger in time as well. 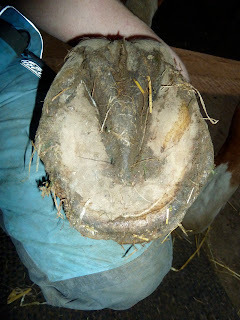 The change in the left front is less pronounced but is nevertheless going to be quite a shift in hoof balance. I've just updated the Project Dexter results tab at the top of the blog. Project Dexter is a way of tracking how rehabilitation at Rockley compares with conventional treatments and covers horses who've been diagnosed with DDFT/collateral ligament damage (on MRI) or navicular syndrome by nerve blocks and x-rays. I've now tracked 23 horses - 18 have completed rehab and 5 are here at the moment and a summary of the results is on the blog page. The detailed results are too big to include here but if any of you would like the results on email, please let me know. Its sometimes difficult for horses to be re-assessed by the same vet, and so not all the horses who've gone home sound and in full work have been re-vetted but a huge thank you to those of you who have been able to do so. 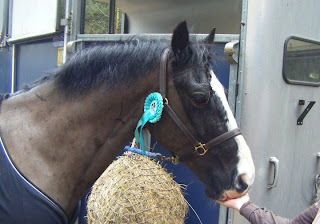 The latest horse to be re-assessed was Rose, and it was lovely to receive a letter from her vets confirming that she passed her re-assessment sound in walk, trot and canter - brilliant news and great to hear that she is going from strength to strength and still stomping about on her fantastic hooves in Yorkshire! 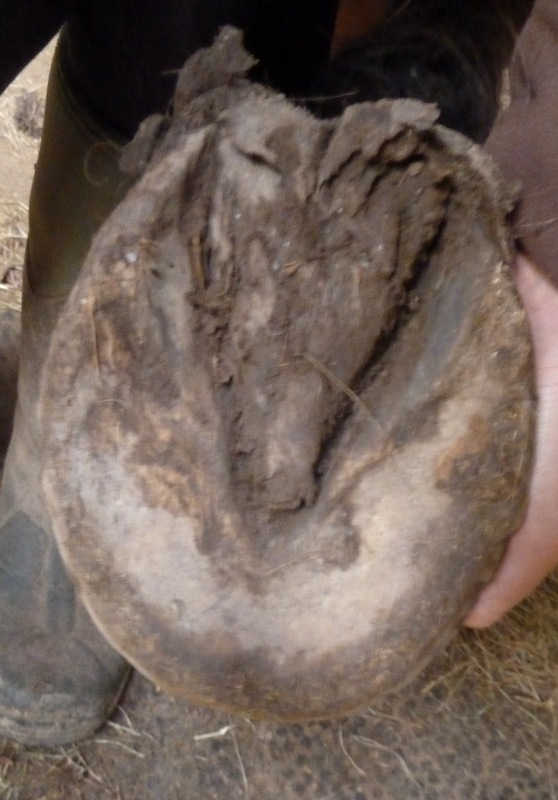 Sarah and I got back yesterday from a fantastic weekend in Poland, where we had been invited to speak at a 2 day seminar on hooves (KOPYTA - hence the blog title!) in Warsaw. It was amazing that over 100 people attended, and didn't mind sitting inside despite beautiful weather over the 2 days! ...but also very many of the other people who've spent weeks and months reviewing it, translating it and trying to make it relevant to Poland. We were really bowled over to learn that veterinary professors, an eminent farrier and numerous experienced horseowners had all become involved, given their time and - even more encouraging - had found the book interesting. Thanks especially to Jan Ciolek (one of Poland's outstanding farriers) for contributing the foreword and for all his input over the weekend, Anna and Kuba Stepkowscy (publishers extraordinaire), Kasia Kulikowska (our indefatigable interpreter, on the right in the photo) who worked tirelessly from at least 8am till 10pm every day without a break and still kept smiling!) and our very kind hostess, Beata (on the left) who not only fed and housed us but was the inspiration and organisation behind the whole weekend - and of course her incredibly patient husband, Jerzy, who put up with us, entertained us and drove us to the airport despite having no interest in horses and having run a half-marathon the day before! 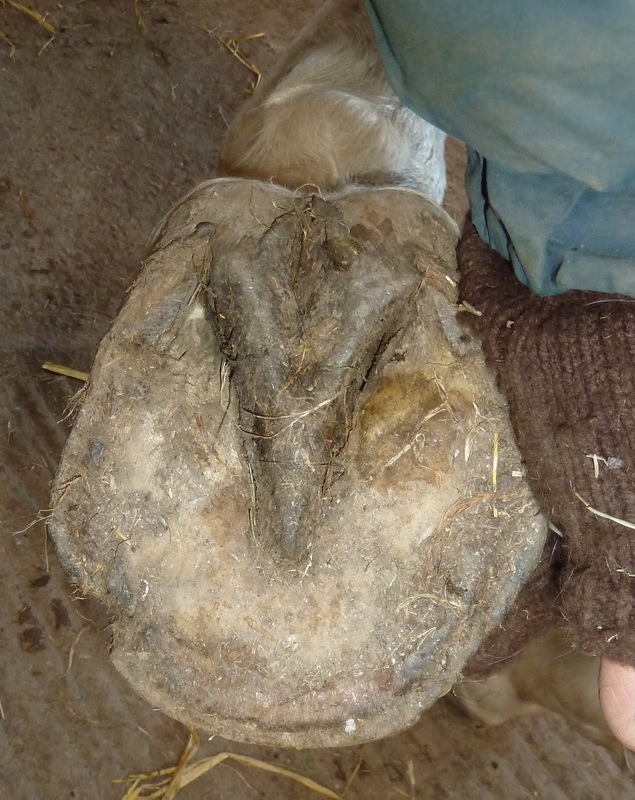 Kopyta - shod and unshod hoof comparisons from Nic Barker on Vimeo. He is a very sweet boy and Charlie keeps trying to persuade him to hang out with him and Felix, but he adores Lucy and where she goes, he goes. 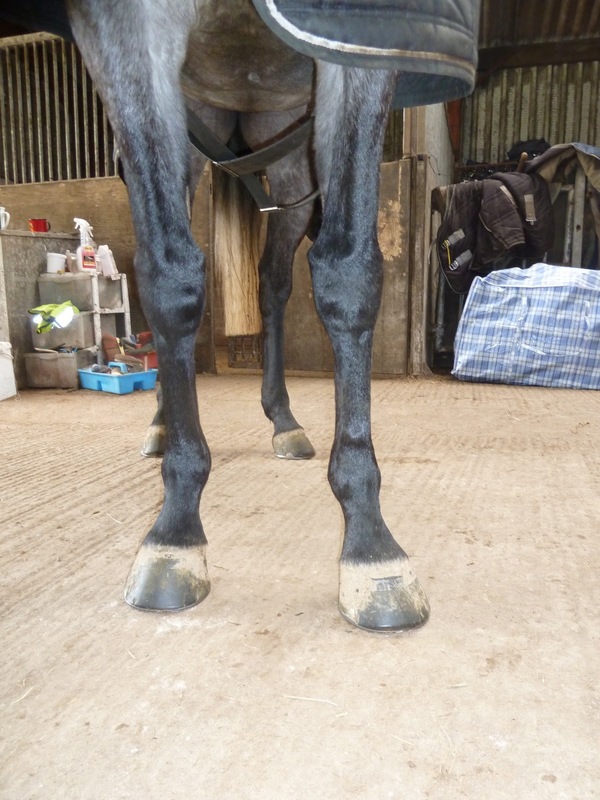 Dilly is the eldest of the current rehab horses, but that hasn't stopped her from being in a rush to improve her hooves. She changed her landing rapidly, but subsequently had a bit of a setback - perhaps because her enthusiasm got the better of her. She has made good progress over the last 2 weeks, though, and the photos show more clearly what has been happening. Here is her LF on the day she arrived. A nice hoof with generally good proportions, reasonably good heels and lots to like. Despite that she was toe first landing and had been diagnosed with navicular problems in both front feet. 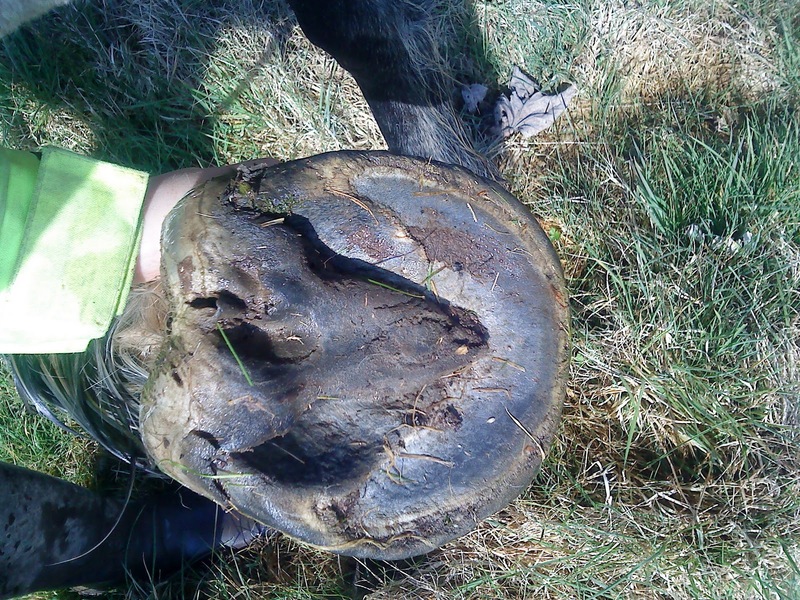 But look at the same hoof 4 weeks later - an even better frog, more supportive heels, and more strength to the back of the hoof. Her landing has been better for a week or more and it shows. Another huge improvement over the last couple of weeks has been that - although Dilly still loves Oscar (of course) - she is now happy and relaxed without him. She will hang out with other horses (yesterday Felix, Charlie and Angel were her boys) and will work happily in the school or out on exercise on her own, which is really lovely to see. 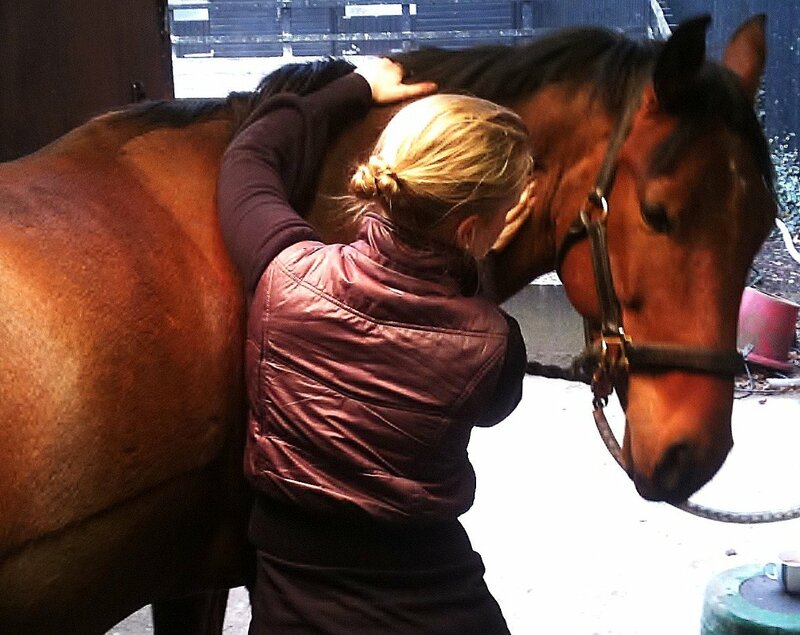 A very interesting day yesterday when Susi Maxfield, an equine massage therapist, came to do some of the Rockley horses. 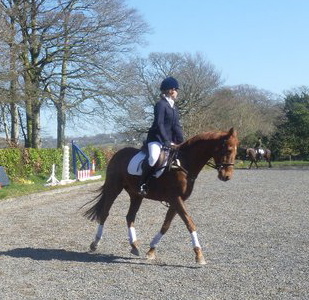 She is based way down in Cornwall but we have worked on horses together before and I was delighted to be able to persuade her to add Rockley to the northern edge of her round! Horses are usually very good at indicating what they think of bodywork, and Lucy - who has a lot of weakness in her hamstrings particularly on the right side - was especially demonstrative, first having a big stretch and cleverly using the wall to help(!) and then sleeping it off. ...with how it looked yesterday - better structure, more even loading and stronger and more level heels. 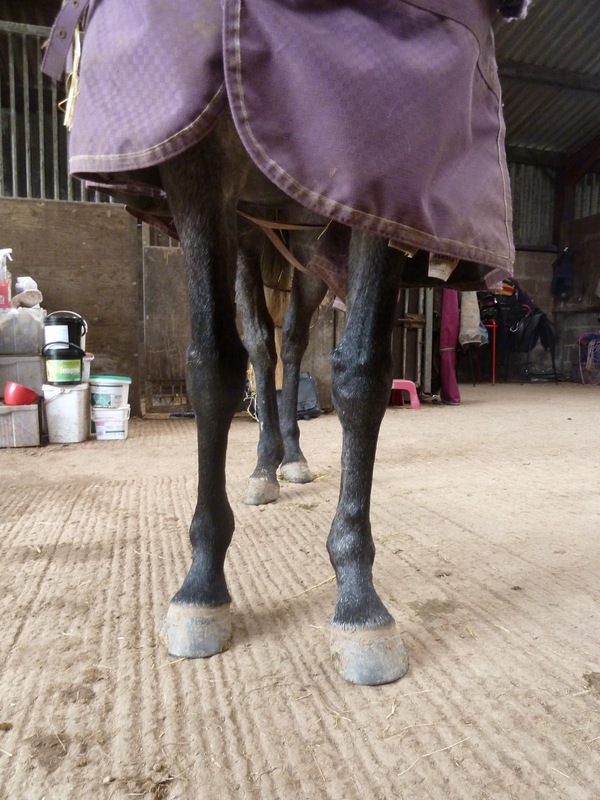 This of course has a knock-on effect on her stance and how she loads her hooves. She is a tough little horse, but even I was amazed at how fast this is happening! Compare the way she is loading her hooves, between when she arrived (day one above) and now (below). The weather was so gorgeous over the weekend that obviously everyone was inspired to get out and about and - more importantly for me - to take photos - brilliant! First off there was Lucie's great news about Solomon, which I put up on Sunday - and here is his photo, which I've pinched off Facebook - doesn't he look wonderful, albeit, as Lucie says, a bit hot and sticky?! 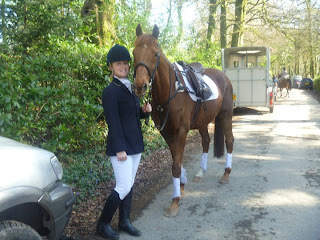 Then I had an email from Fayley, updating me with Isha's progress - its hard to believe she only went home last month! "Just thought I would give you a little update on how Isha is doing, she is still a very happy girl and I'm loving every minute of having her home (well almost, the welsh mountain cross ponies I have brought home to keep her company have shown up that although my hedges are horse proof they are no match for scrambling ponies, so we've spent a good few hours putting up new fencing - with lots of 'Now I remember why I don't keep ponies!!' remarks shouted at them as they find yet another escape hole!). Isha has decided that new hoof growth is far too slow and trundling along gently isn't her style so she chose to up the pace this week and is happily striding along on the level tracks, trotting merrily on the roads and although she is still picking her way along rough tracks she's less tentative, so I'm very pleased with how she's feeling. 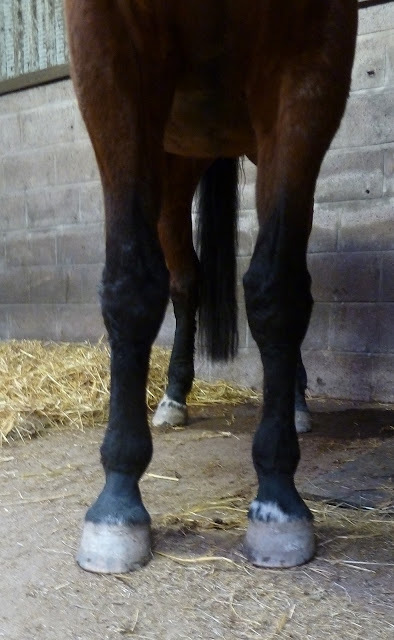 She is still slightly short in trot on that weak RF [This is the foot where the abscess left lots of old damage which hasn't yet fully grown out], especially if we've done a good hours ride the day before but if I'm trotting her after a couple of days off it is barely noticeable (I'm probably more aware of it because I am looking for it). I would be happy to keep her at walk but she likes to have at least a little trot most days so I let her choose the pace. I've attached some pics after an impromptu hoof photo session today, we'd just ridden though a deep puddle so had clean hooves for a change and were on a relatively flat track and as we don't have any even surfaces at home I thought I'd jump off and take some pics. They were only on my little camera phone so there is a little distortion so her toe looks a little long and the hoof asymmetric but it is just the camera angle. Just thought you may like them for the interest of any blog readers who may wonder how hooves cope once they go home - I can happily say Isha's hooves are totally beautiful since leaving Rockley 4 weeks ago. She lives in less than ideal conditions out 24/7 on wet clay fields so very soft muddy ground. They have maintained a naturally rolled edge and short toe, on 30 to 60 minute hacks 3 to 4 times a week, 90% of which is on roads the rest on rough tracks. " She was very pleased with him, and as you can see Kingsley lapped up all the attention - you can read Wiola's full blog post here. Kelly is having to move up to London, so Dexter is looking for a new home - if anyone is looking for a barefoot superstar and can offer a truly 5 * home to a totally 5* horse, email me and I will put you in touch with Kelly. I took some new footage of Oscar over the weekend. He has now been here 4 weeks and as you can see from the video has just started to improve his landing. 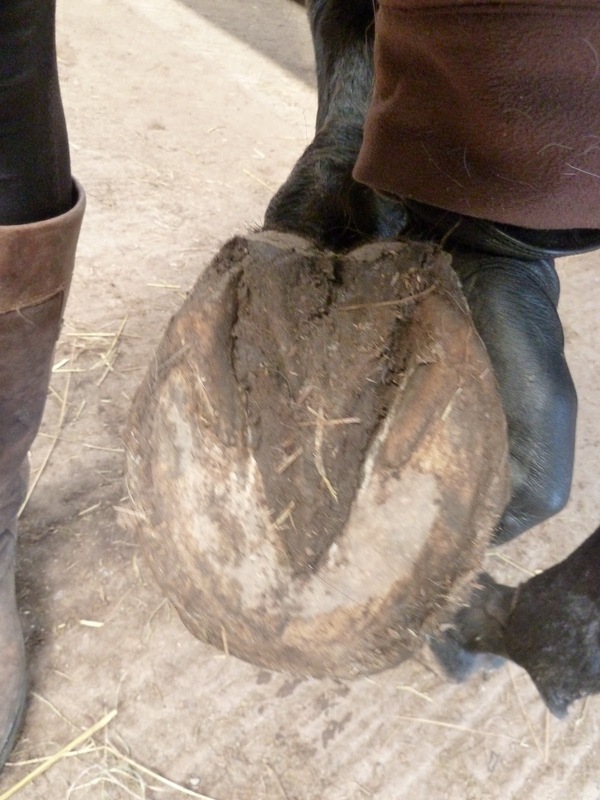 Its not that he has been slower than Dilly, its just that - as you can see - he had an enormous amount of hoof changes to attend to in the meantime, as well as sorting out his bioemechanics. His heels and frog are broadening and becoming stronger - the frog may look a bit tatty but its actually much more robust than it was! Along with big changes in his hooves, there are changes in how his limbs are loading too. Although these changes are improving his biomechanics, changes in loading mean challenges to muscles, tendons and ligaments as they get used to new stresses and this is a slow process. Oscar - updated footage from Nic Barker on Vimeo. Lucy has one big advantage over the other rehab horses - her age. 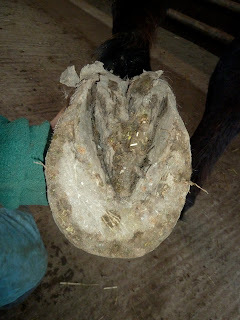 She is only a 4 year old, and unlike many TBs of the same age, has only been shod for a short time. Although the graduated bar shoes she arrived in hadn't improved her way of going, underneath them she still had very nice feet and, importantly, a reasonably good digital cushion and frog. 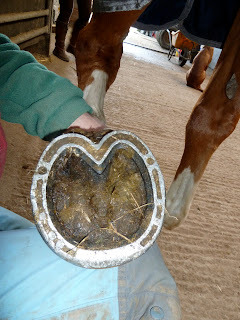 With many of the horses who come here, rehab is a double job - not only rehab of the specific lameness or injury but also rehabilitating parts of the hoof which have not had to develop or work in shoes but which do need to function in a barefoot horse. 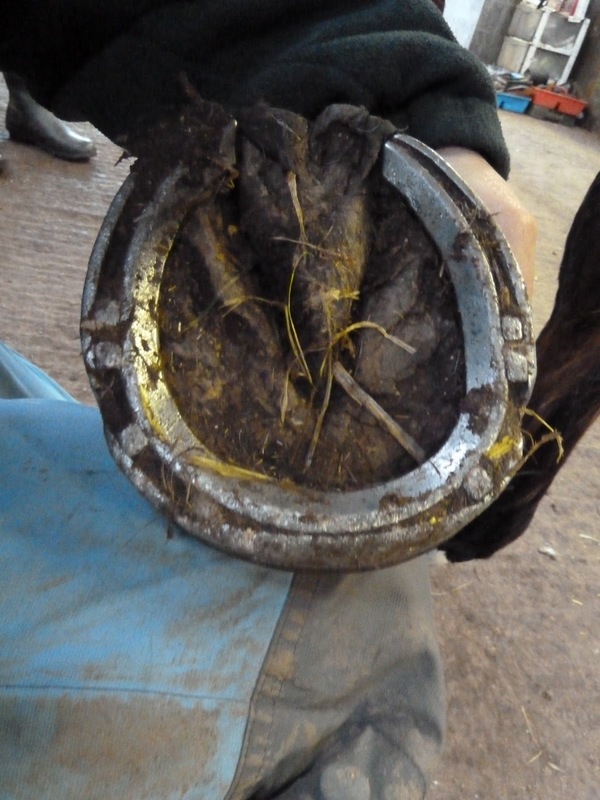 Add to that a big change in how the hoof is loaded, and its no wonder that horses who have been shod for some years can find coming out of shoes a shock to the system. With Lucy, there are already big changes happening in her feet, and especially in medio-lateral balance (photos to follow but we ran out of time today), but in the meantime she has hooves which are used to being able to function without a shoe and its allowed her to make rapid progress. Her owner came to visit today, and though I wouldn't normally expect a rehab horse to be working under saddle in less than 2 weeks, Lucy was ready for a short ride out and it was great to hear that Sam - like me - was delighted with how well Lucy was feeling! It could have been Lucy, who is an Irish TB, but Zan got the spot as he was not only bred in Ireland but has lots of Irish Draught in his pedigree :-) Plus Lucy's owner is visiting today, so I hope to have new footage of her for tomorrow's blog. When you see feet like these, its often presumed that bad farriery is the cause, but I think that's unfair. You can see by comparing these photos of Zan, in his shoes on arrival, and without them a few days after, that although the bar shoes were intended to provide "support", in fact they had made his heels under-run even more. 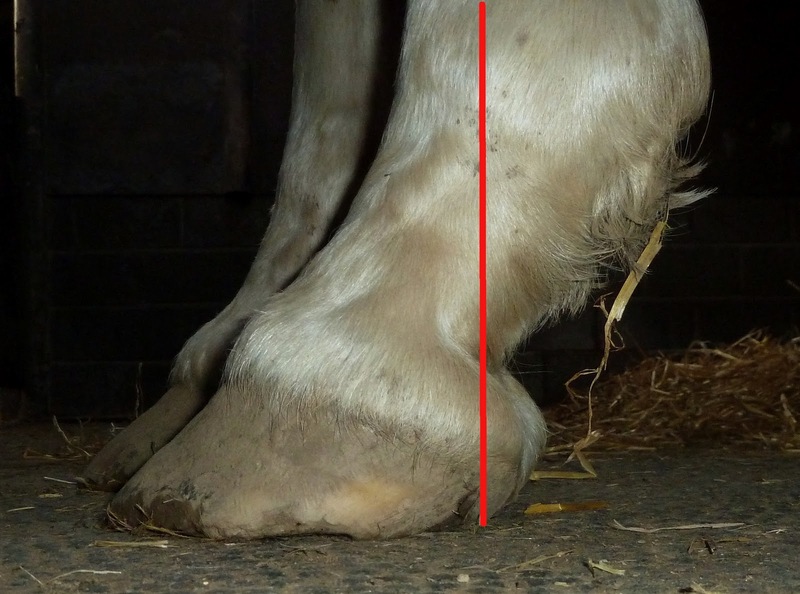 In this photo, his hooves have hardly even started to improve, but there is already a better hoof pastern axis simply because his heels are providing more support - without a shoe - than they were when shod. And if I put lines on, you can see how the bar shoe actually moved the point of ground contact further forward, not (as intended) further back, making the under-run heel worse. A small but significant difference after only a few days. ...and 10 days out of shoes. Already the toe is coming back and the frog is functioning better, but it will be longer before these improvements to the hoof translate to improved performance and for the moment Zan is still cautious on tough surfaces.